In September Roy Williams and I will be giving the keynote for this conference in Graz, Austria, at the invitation of Jutta Pauschenwein and her colleagues. The title of the conference for those who do not speak German is Evaluation of Open Learning Scenarios. This is the first blog post in a series that we hope to write between now and September 17th. The aim is that these posts will act as advance organizers. We know from experience that some of the ideas that we will discuss in our presentation need more time and reflection to take in than will be possible at the conference itself. We also know that we won’t have time at the conference to cover everything we have thought about in relation to this presentation and all the work we have done on the Footprints. This is a small annual conference (usually about 100 people). Last year the conference topic was very popular – Learning with Videos and Games; 150 delegates attended. Jutta has told us that this is the 13th year this conference has been offered. It attracts a loyal group of delegates – university teachers, school teachers and trainers of companies, from Austria, Germany and Switzerland, some of whom attend year after year. Jutta has told us that unlike many of the German speaking conferences, which focus on scientific articles and presentations, this conference takes a more pragmatic approach and attracts an audience who ‘want to know how to do something’. Jutta has therefore invited us to speak about how we use our work on Footprints of Emergence to evaluate learning in open learning environments. She herself has been using our Footprints of Emergence drawing tool extensively since 2012. 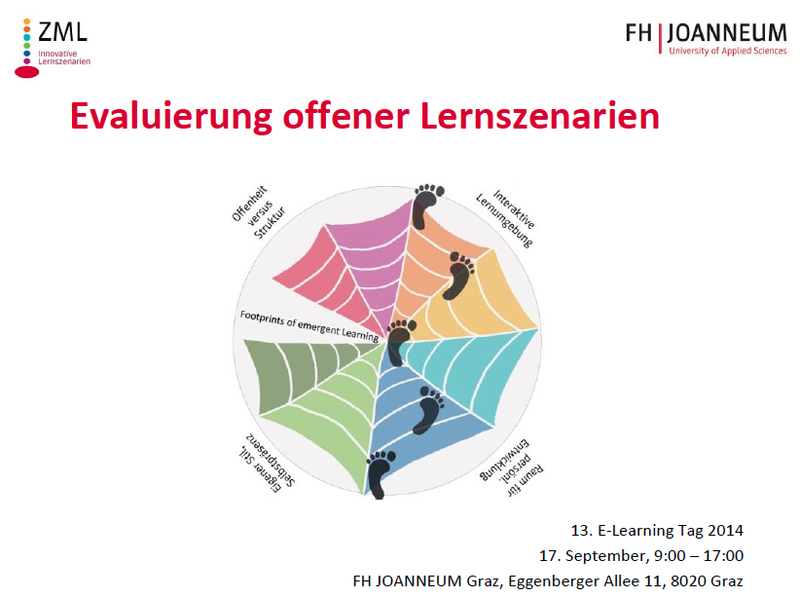 Jutta and her colleagues recently used the Footprints for an assignment in their MOOC – Competences for Global Collaboration (cope14) and have often used them in their work in the past. Jutta blogs about them and has, with her colleagues, written articles and presented papers at conferences that make reference to the Footprints. This paper is situated within the paradigm of open, emergent learning, which exploits the full range of social and interactive media, and enables independent initiative and creativity. Open, emergent environments change the way we experience learning, and this has implications for the way we design and manage learning spaces, and describe and analyse them. This paper explores the ways we have engaged with these issues, as participants, designers, researchers, and as facilitators, and how we have reflected on, visualized, shared, and valued the rich dynamics of collaborative discovery. In particular, we explore how emergent learning can be enabled by using uncertain probes rather than predictable outcomes, by emphasizing tacit rather than explicit reflection, and by seeking ways to give the learners back a real voice in a collaborative conversation about the value of learning and teaching. I don’t know how often the keynote for this conference has been given in English. Unfortunately neither Roy nor I speak German, but we welcome comments on this blog in either German or English. Most of the papers for the conference will be presented in German, but Jutta and I will run a workshop at the end of the day in both German and English. It goes without saying that we are very much looking forward to meeting Jutta and all her colleagues and are grateful for this opportunity to present our work in Austria. Don’t be afraid: you are not the first one to give the keynote in English 🙂 And in the proceedings there will be 4 papers in English as well. I also look forward to meeting you in Graz! Thanks a lot for this blogpost and for introducing me to the concept of advance organizer’s. I found the concept and your post very useful in preparation for the conference. Natasa – thank you for your visit to my blog and for your good wishes. We are looking forward to meeting you too! Your message is very timely as I have been working on/thinking about the conference presentation this morning. We will be making more posts related to our preparation for the conference at the end of the month. Jutta has told us that many conference delegates will be on holiday this month, so it would be better to make further blog posts at the beginning of September. So please look out for them, if you have time, and raise questions or comment if you would like to. Hi Jenny! Yes, beginning of September sounds like a good time for the next post. I look forward to reading more background information about your keynote and will redirect to my personal networks. And a first question: I guess that offering an advanced organiser to your audience makes you think and reflect a lot uppon their knowledge so far and their needs and is a great preparation for you as a presenter as well. Is that true? Hi Natasa – thanks for this good question, which has had me thinking about what assumptions I have made about the audience (I will let Roy speak for himself!). We have been given some information about the expected audience from Jutta and from that I have assumed (maybe incorrectly) that although there will be some people who are familiar with our work on Footprints of Emergence, perhaps there will be more who are not. We are also not sure how familiar the audience as a whole will be with working in ‘open environments’ such as cMOOcs, as opposed to just knowing about them. However, I now realise that I have made the assumption that most, if not all, the audience will be familiar with the ideas around reflective learning – but I’m not sure whether that extends to emergent learning and learning in complex environments. Important for us too is that we cannot assume that everyone is comfortable listening to a keynote in English. For those who are not, then hopefully the blog posts will provide a ‘back up’ resource, which can be engaged with at a slower pace and revisited after the keynote. And – ‘yes’ – thinking about advance organisers and what information to provide before the event, has been a great way to think through what the presentation might/should include and whether or not we can communicate our ideas clearly. I think the intention of advance organisers is to make the introduction of new ideas easier for both the presenter/teacher and the learner/receiver. thanks for giving me an insight to your preparations. Ok, I will let you know about the advance organizer 🙂 Although I can only tell for myself I guess. Regarding the keynote beeing in English I would expect most of the audience to undetsrtand the keynote well but be reluctant to ask questions and engage in discussion. The latter is usually due to little practice in speaking. Maybe it will be necessary to give the audience some extra time if you wish them to communicate in english. I must also say that I have listened to one of your videos about the footprints and would expect everyone to understand you :-). You have such a clear way of speaking and articulating that I don’t think the language will be a problem. Regarding your assumptions about the audience I would have made the same ones.